August 30, 2013  The Southern Poverty Law Center says Paul Craig Cobb and his supporters planned to grab control in 16-resident Leith and declare a "White Nationalist international community." November 7, 2012  Senate Democrats did better than just keep their slim majority. Wednesday brought news that they expanded it by managing to retain control of two of their most threatened seats, in Montana and North Dakota. October 7, 2011  Some see doom in North Dakota's oil boom, and criticized the music, tone and sourcing in a weekend story. The editor responds. June 27, 2011  In Minot, N.D., floodwaters are finally starting to recede into the Souris River, according to a National Guard spokesman who talked to the AP. 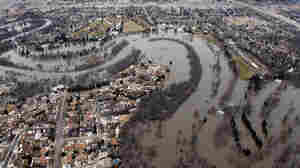 But in the town, 4,000 homes have been damaged by the river, and thousands of residents remain homeless. February 22, 2011  It's sandbag season in North Dakota and Minnesota, where communities are banding together to keep the coming spring thaw from overrunning riverbanks and swamping towns. But one town's plan to pay sand-baggers has sparked anger across the river. January 18, 2011  Conrad's retirement will make it harder for Senate Democrats to hang on to their majority. North Dakota elected its former Republican governor John Hoeven to replace Democrat Byron Dorgan. Republicans were buoyed by Conrad's announcement. November 2, 2010  GOP Senate candidates made 3 blue states red. But W. VA seemed to thwart hopes of Senate control. That normally red state chose to send its popular governor to Washington.